Ice Cream Scoop, Stainless Steel Scoop with Non-Slip Red Handle---(Medium) by N.E at Baking Love. Hurry! Limited time offer. Offer valid only while supplies last. The ice cream scoops are made from high quality grade stainless stainless steel, and do not contain any harmful chemicals or toxins that seep into your food. The diameter of the size Medium scoop is 2.0 inch, it could hold 1.4 ounces capacity. 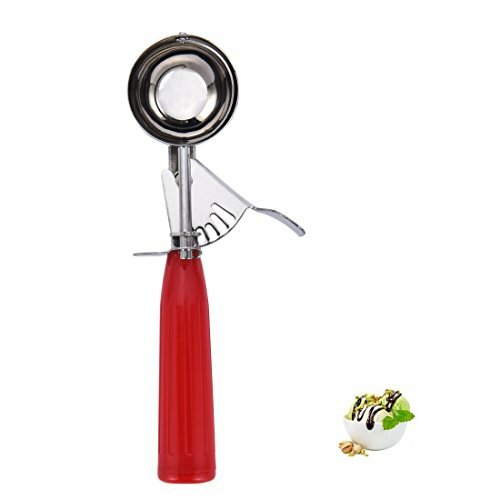 Every scoop equipped with an integrated rotating lever, you could easily scoop out rounded balls of ice cream, sorbet, fruit, meatballs, cookies, cakes and more. The stainless steel scoop comes without springs BUT with cog and ratchet which relieve the pressure on your wrist and hand. Each size has a different handle color marked for easy recognition. Also the colored non-slip handle fits comfortably in your both two hands. If you have any questions about this product by N.E, contact us by completing and submitting the form below. If you are looking for a specif part number, please include it with your message.